Eden Manor Bridal shop offer a range of formal weddings suits in Ireland to make your wedding as memorable and elegant as possible. Located in the heart of County Wexford, Ireland, Eden have years of experience fitting women and gentlemen alike, with an aptitude for transforming the ideal you have in your head into reality. 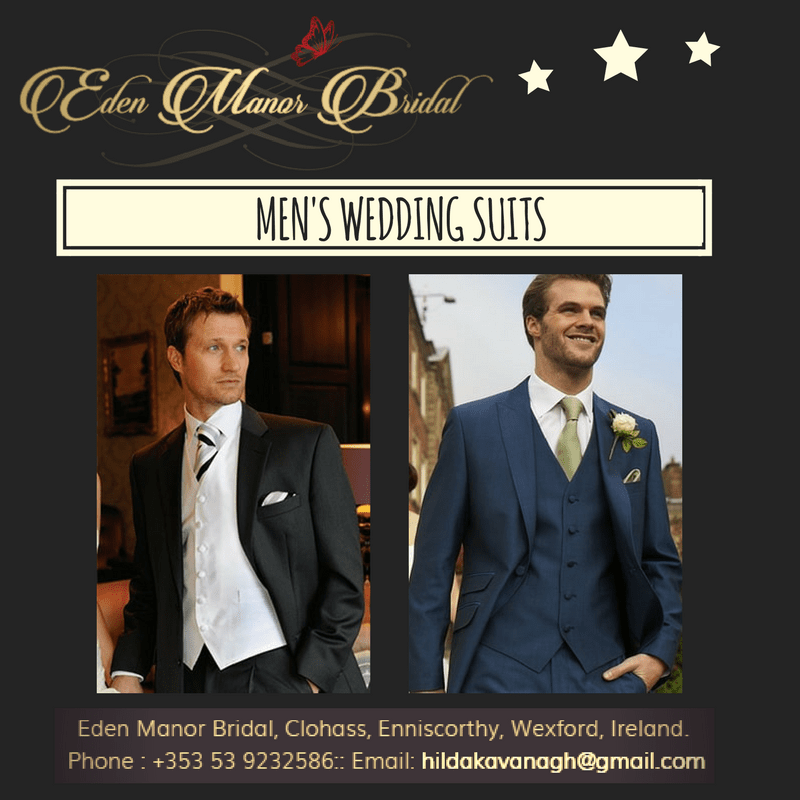 Here at Eden, we provide a range of men’s wedding suits in Ireland to match the individual character and requirements of the wearer. Whether you are looking for a suit designed in rustic tweed or you are going for a more classical black tuxedo look, we can help you decide on what fabric to choose and match with your wedding’s theme. This service extends through all details of your chosen suit – fabric, hem and button. Call us now on +353 53 9232586 or email hildakavanagh@gmail.com for any assistance. Choosing men’s wedding suits is a high priority task to complete as part of your wedding preparations. Suiting up and choosing your suit is all about a quality fit that reflects the needs of the customer. Wedding suits are important details and should not be considered a last minute option. As such, detailed ties, quality tailored shirts and a variety of different suit types are available at Eden so that you can truly stand out and make an individual statement. After all, this is your wedding; it should be unique and significant to you. Whether you are buying or renting, looking for tailored or off-the-rack, your suit is a personal statement. That is why it is important to look at the whole ensemble and to consider how aesthetic flourishes between the couple can help life your wedding so that it is the unique experience it should be. By choosing the services of Eden Manor Bridal, you can skilfully craft a wedding that is truly emblematic of both the bride and groom; one that is truly reflected in both your dress for the bride and your wedding suit for the groom, best man or guests. By guiding you through your choice, tailoring and collection, Eden make sure that at each step, you get the look you deserve. To book an appointment with us or enquire about our range of quality men’s wedding suits, please telephone +353 53 9232586 or email hildakavanagh@gmail.com. We look forward to hearing from you!